After too many cookies with our milkshake and coffee one morning my youngest and I were eager to get out into the beautiful Melbourne sunshine and run, climb and slide off some of that sugar fueled energy. 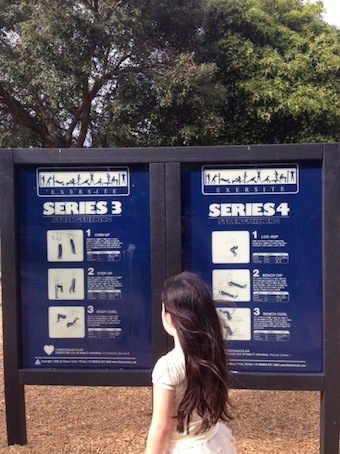 That's how we came across and developed a deep adoration for Halley Park in Bentleigh. 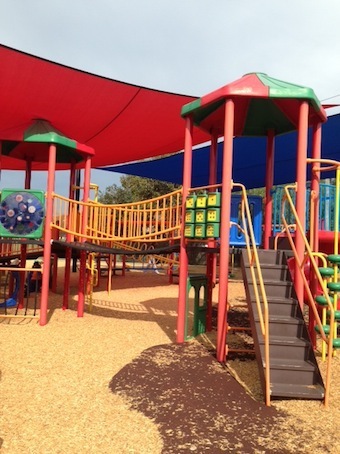 Although situated on busy Jasper Road, the actual playground area is nestled back closer to the suburban streets making you forget about the traffic and the everyday chaos that's taking place right in front of you. Lots of colour to spark interest and excitement. 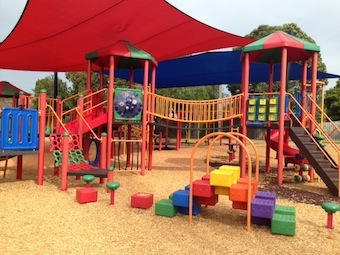 This is a great local playground with heaps to do and an area big enough and welcoming enough to make it useable and enjoyable even on the busiest of days and on weekends. And you can beat it gets busy, particularly by locals and neighbours who stream here to enjoy all the available opportunities for outdoor fun and recreation. Shade sails that will remind you of a circus big top create a beautiful retreat on hot and sunny days which is a pleasing bonus. 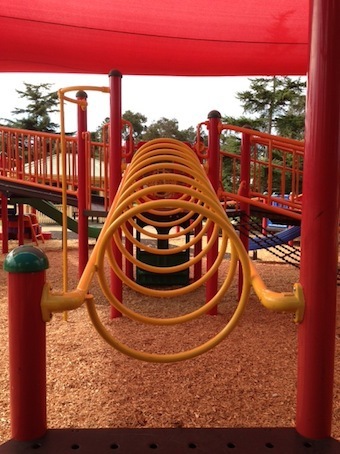 The first thing you notice, other than your child taking off at record speed is the brightness of the playground, so colorful and inviting and with so much to do there's sure to be something to suit all park experts aswell as kids of all ages and developmental stages.There are slides that twist and poles that turn and frogs to leap over. There's a few educational installations placed strategically about such as a noughts and crosses board, bead frame and a store window for a bit of role play. Children love to chase and race each other over and under the bridges that join the landings and slide off to make a quick getaway from each other, and from their parents too. Climb, run, swing and fly. 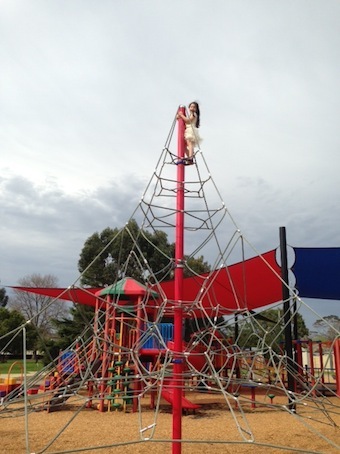 Older kids will be fascinated by and tempted to climb the massive monkey bar teepee and be king of Bentleigh castle. It's a high structure and as a parent it can be daunting to watch your kids scurry up particularly when a couple of pocket rockets are vying for prime position high on top. However if it helps your nerves at all, there's pine mulch underneath. The monkey bar Teepee is not for the faint hearted. 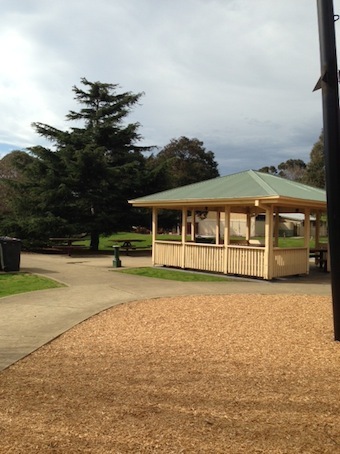 Surrounding the play area is a circular track which is perfect for bikes, roller blades, scooters or just some lazy pram pushing. Great place for practicing on training wheels or maybe a chance to try without. There's a basketball hoop too so bring a ball. Infact make the most of the lush green surroundings by bringing a picnic, frisbee, kite or just run around aimlessly without a care and nowhere particularly to go. Shade sails that are as colourful as a circus big top. The park is also separated into an on-leash and off-leash area for doggy visitors.There are signs to point you in the right direction. I'm very envious of anyone whose dog can either read the signs or better yet sticks to their side of the park. But great to know that kids can play with or without their furry friends nearby. However the park is not fenced off at any point and although its layout does provide for a good visual of all the area, I strongly suggest you keep vigilant. Finally if you still have some energy or kilojoules to burn head to the exercise stations and get started on a circuit. These small fitness activities are popping up at the occasional park in Bayside and I have seen kids have a great time on them. I'm not sure if they're actually performing the moves as described but they are swinging off the chin up bar, sliding down the sit up bench and hopping over the step up steps, which actually sounds a lot more fun than the regular way. We tend to spend more time in this part than any other of the park having to complete three circuits before we can leave, including the warm down and stretch too of course. The exercise stations are good for you and fun too. If you arrive early enough there is a beautiful undercover rotunda with built in tables and chairs located right by the barbeques and bins. These are often snatched up by larger groups or parties. However if you would like to hire one for your own purposes then the expectation by Glen Eira council is that you will ring them and do it that way. I'm not sure if there's a cost involved or how they police it, but jump on the website and make a call. I believe the waiting list may be as long as a month in advance so it would pay to be organized. A rotunda is available for hire. Spring is definitely here Melbourne and now is the time to ready ourselves with sun on our skin and glare in our eyes and this is a lovely place to do just that. Bring your family and friends and see how easy it is to spend a whole day at Halley Park. Your wallet wont even feel lighter as you head home. Having said that the ice cream truck does make regular visits here and up the road are a lot of lovely shops and cafes, even a milk bar. So if you need to restock your supplies at any time or the cries of "I'm hungry" start ringing out of mouths of those who just ate lunch you don't have far to go. I always used to call that monkey bar teepee the spiderweb tower. 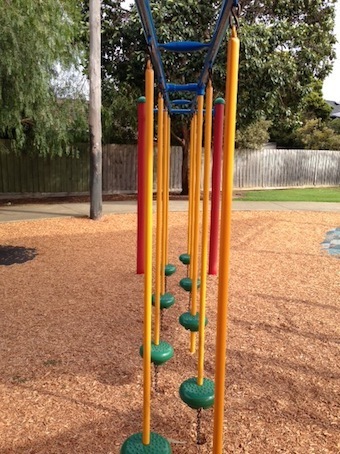 I think they are an essential part of any playground. Are there public toilets at the park?